The stone house is a replica of a stone house of the mid-nineteenth century. Our barn is a replica of a typical barn of the mid-1800's. Our museum holds many artifacts of Hammond's past, including structures such as this. The museum building process was no easy feat! Thank God for the support and labor of love of so many great volunteers. R.T. Elethorp: an inspiration to Hammond! In the early 1900s Rob T. Elethorp hand-crafted a large collection of miniature buildings including replicas of two churches, a barn and farmhouse - this is one of the unique features of our local history museum! For a few years they were stored at the back of the library. Finally, in 1986, several interested local people met together and formed the "Robert T. Elethorp Historical Society" - now known as the Hammond Historical Museum! Hammond is a located in the Northwest corner of St. Lawrence County. The name is derived from early land owner Abijah Hammond. The Village of Hammond lies approximately centrally within the Town. At the time of the 2000 Census, the population was 1,207. Hammond is older than the city of Chicago and at one point was larger! However, due to location Hammond lost its population. The Town of Hammond was formed in 1827 when portions of the Town of Morristown and the Town of Rossie were combined. Subsequent small alterations in the town lines affected the neighboring Towns of Rossie, Macomb, and Morristown. Alexander Macomb bought land in this area and this was known as the Macomb purchase. Later this land was bought by Abijah Hammond, a New York Businessman, he in turned sold 28,871 acres of land to David Parish. A land office was opened in 1814 in Chippewa Bay, a sub-community of the Town of Hammond today. By an Act of New York State Legislature they passed that Hammond was officially a town, this happened on March 30, 1827. 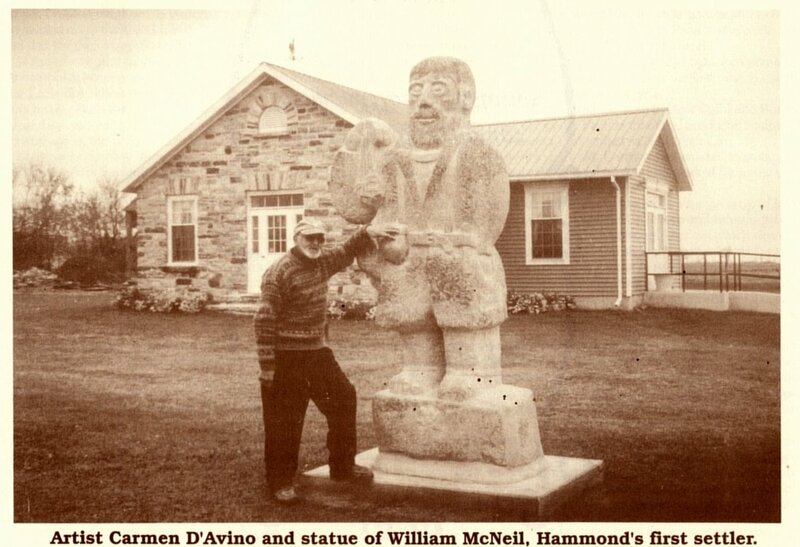 The first resident of Hammond was in Chippewa Bay and this was William McNeil. He was originally from Vermont. He lived in a cave which is no longer there; the spot is marked with a nearby plaque provided by the local R.T. Elethorp Historical Society. A statue was carved in his honor and is located in front of the Hammond Museum north of the Village of Hammond on state Route 37. The cave was covered by construction crews when a road was built to the edge of the bay. Population had increased by 240% by the year 1840. The first school house was built in 1819-1820. The first church in 1821 and the first post office in 1822. The log shanties with thatched roofs were replaced with frame and stone houses, many which stand today. The stone houses built in the early 1800s were built by the first Scottish families immigrating to the Hammond area. A railroad spur line passed through the western side of the Village of Hammond. This was in limited use until the early-mid 1960's. The original railroad depot is still standing in the same spot. Many of the original stone quarries are still identifiable. A stone quarry on Oak Island in Chippewa Bay supplied stone to build Boldt Castle. It even had its own railway to move cut stone to the boats used to transport the stone. A stone quarry, that was once located in South Hammond on Route 37, supplied sandstone to make local roads. This quarry at one time employed approximately 600 men. The Town of Hammond Museum, formed by R.T. Elethorp Historical Society, saved an original quarry building from the South Hammond quarry and moved it to the current museum property. The remnants of where many of the old forgotten business once stood can still be seen today.